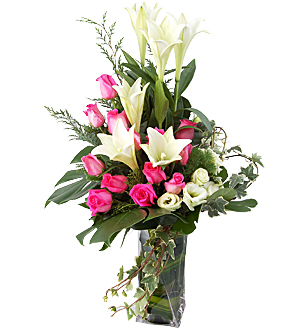 Stylish and elegant, this beautiful mix of Madonna Lilies, Roses and Eustoma sends a warm sentiment to your recipient. Measures approximately 75cm. 24/7 delivery applies for order within Klang Valley (Kuala Lumpur, Petaling Jaya, Selangor, WP) only. For outstation delivery within Malaysia, deliveries are for working days. Same day delivery applicable for order made before 12pm on the day. For flower customization, contact our florist @ Pods & Petals Giftlab at +603-78830233 / +6012-6915200 or sales@giftlab.com.my for enquiries.